Young children are very concrete learner, and usually need something they can see or touch to fully understand a concept. Resurrection eggs are one of the concrete ways we can share the story of Jesus' death and resurrection with our children. 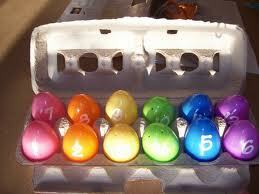 Resurrection eggs can be purchased, but you can also make your own using items around your home. To make your own resurrection eggs, you will need an ordinary egg carton and a dozen plastic eggs, a Bible, and the items listed below. Share about Jesus using one egg at a time. Explain in your own words (and ask your children) what each item symbolizes and read the verses from the Bible. Older children may read the verse.